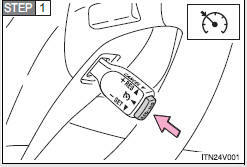 Cruise control “SET” indicator will come on. 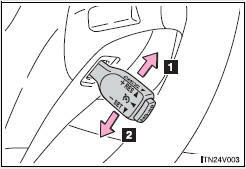 Fine adjustment: By approximately 1 mph (1.6 km/h) each time the lever is operated. 1. Pulling the lever toward you cancels the constant speed control. 2. Pushing the lever up resumes the constant speed control. 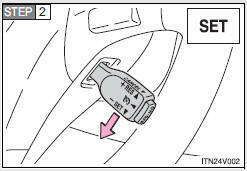 • The shift lever is in D or range 4 or higher of S has been selected. • Vehicle speed is above approximately 25 mph (40 km/h). • The vehicle can be accelerated normally. After acceleration, the set speed resumes. 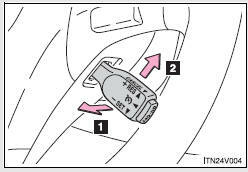 • Even without canceling the cruise control, the set speed can be increased by first accelerating the vehicle to the desired speed and then pushing the lever down to set the new speed. 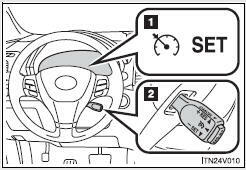 • Actual vehicle speed falls more than approximately 10 mph (16 km/h) below the preset vehicle speed. • Actual vehicle speed is below approximately 25 mph (40 km/h).